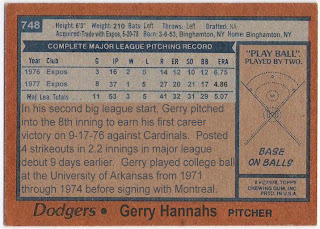 gerry hannahs pitched in exactly one game for the dodgers in 1978. still, that's enough to warrant a card that should have been in my 1978 topps burger king dodgers/update set, so here it is - it was a black and white of hannahs in an expos hat, so it turned out to be a sort of homage to the mike paxton/greg minton cards, although it's more like the jose cardenal card when you consider the hair and the coloring of the cap. as you can see on the back, hannahs was indeed an expo for two seasons before he joined the dodgers. 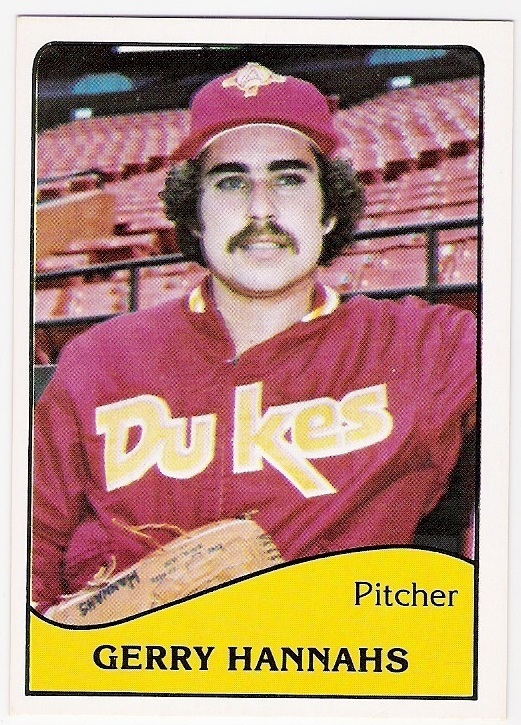 he was acquired in a trade in may of 1978 in exchange for mike garman. 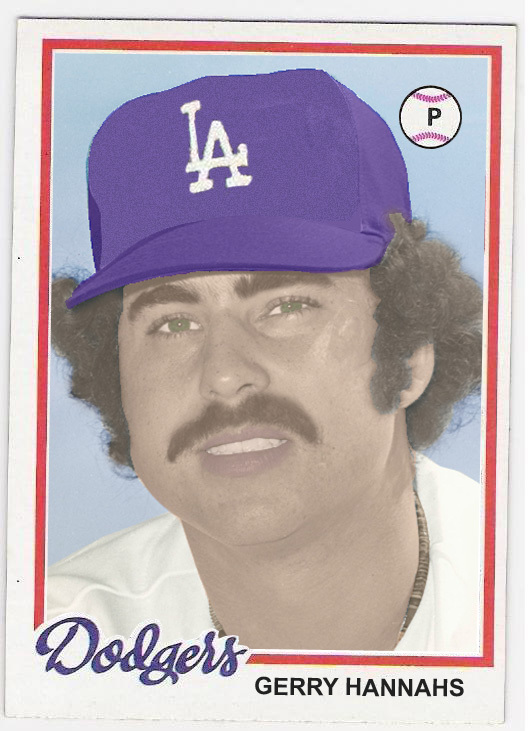 his lone game with the dodgers in 1978 came on september 22 against the padres. we recall that game because it saw the major league debuts of pedro guerrero, dave stewart, and brad gulden. in fact, hannahs replaced guerrero in the lineup, was later relieved by stewart, and was the first pitcher gulden ever caught in the majors. by that game, the dodgers were pretty well set - they had 92 wins and were half a dozen games up on second place cincinnati with 9 to play. 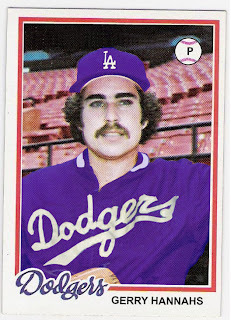 in the game, however, the padres blew the dodgers, and starter doug rau was relieved by lance rautzhan (which was alphabetically appropriate), who was followed by rick sutcliffe, for whom pedro guerrero pinch hit and who was replaced by hannahs. hannahs struck out the first batter he faced (broderick perkins) and chalked up another k in the inning, but gave up a couple of runs before getting three outs. in his second and final inning, hannahs struck out the side, including dave winfield. 5 strikeouts in two innings of work, and his big league season was done. 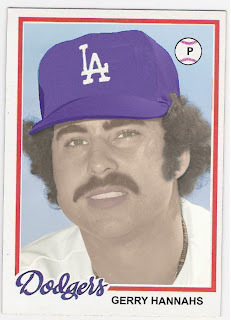 hannahs returned to the dodgers the following september, and appeared in 4 games. his first game of the season is one i remember well - september 7, 1979 in cincinnati. the dodgers were out of the race as they were a dozen games back with 20 to play and they were facing the reds who were neck-and-neck with the astros. 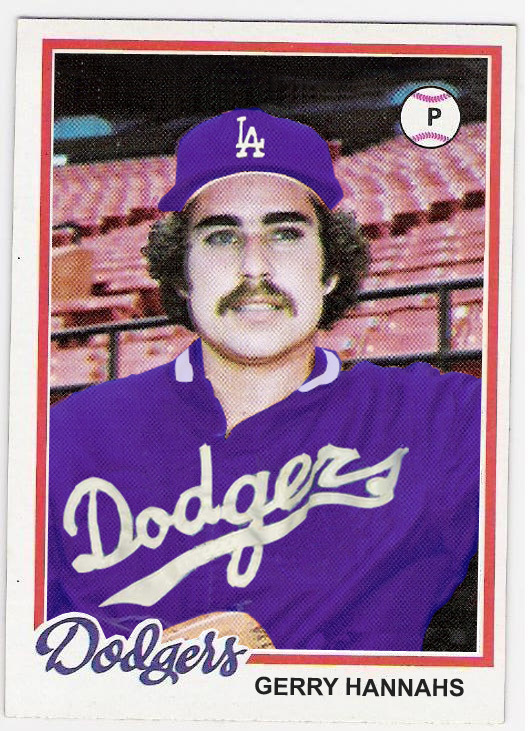 the game was tied heading into the 9th when gary thomasson hit a sacrifice fly to score steve garvey. hannahs was called upon to get the save. he did better than that. he struck joe morgan out. 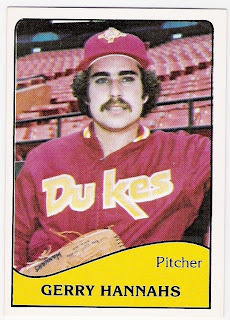 he struck davey concepcion out. then, with johnny bench on deck, he struck george foster out. game, set, match. 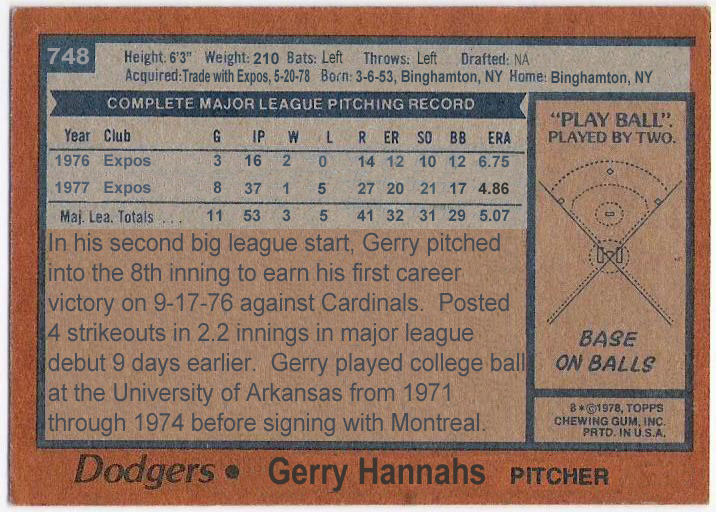 hannahs was the guest on the postgame show that day, and i recall his interview with jerry doggett (or maybe it was ross porter) and the big deal that was made about his return to the big leagues and striking out if not the heart, then at least some major organs of the big red machine. 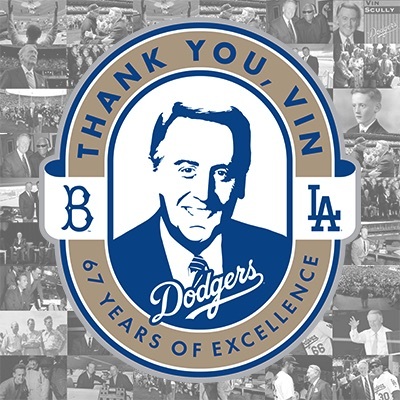 he pitched in 3 more games, two of them starts, and his big league career came to an end. 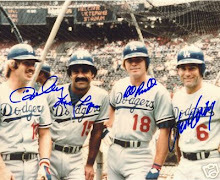 during his time with the big club, however, hannahs was assigned to an autograph station at dodger stadium prior to a game at which i happened to be in attendance. 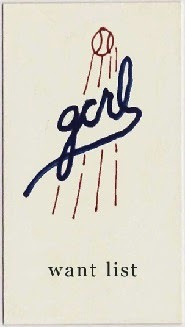 i kept that autograph for a long time and can't believe that i couldn't find it to show off in this post. dagnabit. it turned out ok, although it might be a little purple-ish. i was pleased with the jacket, though. here's to you, gerry hannahs, your day in the sun against the reds that i haven't forgotten, and your cards that should have been! todd hollandsworth through the mail successes!